Today's post is in collaboration with Heirloom Finds. If you haven't heard of them, they are a fashion and vintage jewelry online store. Their humble beginnings originated in yard sales and flea markets and now? They are a leading retailer of online fashion jewelry in the entire U.S. I love a good inspirational story. Don't quit your day dreams. If you're a big jewelry fan like me, then when you browse their site you will be in accessory heaven. Best of all, they are affordable! I was asked to choose three pieces and that was hard because I seriously wanted everything lol. The pieces were amazing and totally my style. This pink and pastel blue statement necklace was the first thing that caught my eye. I love a good statement piece and this one was perfect. It, also, just screamed "Spring" to me with the gorgeous colors. I can definitely use a little Spring in my life! I paired it with a black and pink combo to make it stand out even more. Over the weekend, when I shot these pictures, we had good weather over on the east coast so I didn't need much layering. 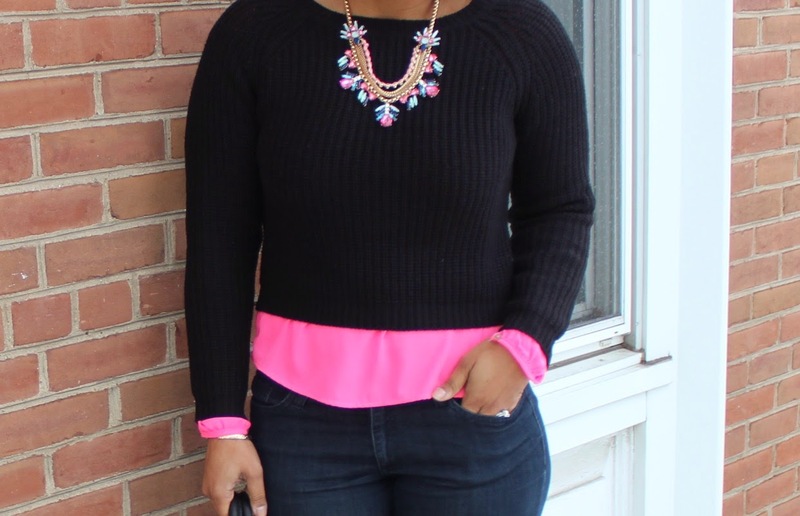 I wore a pink chiffon shirt layered under a black crop knitted sweater. The statement necklace was the perfect pop to the outfit. This outfit is what I call my anticipation to spring! 11 more days, not that I'm counting or anything. Enter the giveaway below for a chance to win a $25 credit to Heirloom Finds. Stay tuned this week for another style post with Heirloom Finds. This post was sponsored by Heirloom Finds. All opinions expressed are my own. Your look is amazing. The crop top with the hot pink shirt love it! But I die with the necklace! Love the combination of black and hot pink on you! The necklace makes the whole outfit pop. I have entered and would love to win :D My email address is perezashley60@hotmail.com I love your outfit!!! Love the touch of pink under your sweater. I am blown away by how you accessorize your outfits!! That necklace is GORGEOUS! You go girl! And thanks for being so sweet and doing a giveaway!! Fingers crossed!! Done! Thank you for the chance. I love your posts! You do look ready for Spring...lovely!